According to the American Heart Foundation, about 35.7 million American adults are at high risk for high blood cholesterol. Cholesterol is a soft, odorless, waxy type substance which is part of all human cells. Although cholesterol gets a bad rap, humans could not live without it. Cholesterol is used by the body in brain and nerve development, hormone production, and digestion. However, too much cholesterol in the blood (high blood cholesterol) can lead to chronic degenerative disease. What is high blood cholesterol and its symptoms? High blood cholesterol means there is more cholesterol present in the bloodstream than is recognized normal for healthy functioning. High blood cholesterol on its own does not cause symptoms, so many people who have high cholesterol are not aware of it without testing. The National Heart, Lung and Blood Institute recommends everyone age 20 and older should have their cholesterol levels checked at least once every 5 years. In adults, total cholesterol levels of 240 mg/dL or higher are considered high risk. Levels from 200 to 239 mg/dL are considered borderline-high risk. HDL: High-density lipoproteins – The container that transports cholesterol from the body’s tissue back to the liver, where it is eliminated. HDL will also move cholesterol to the liver for recycling in the body or use in the digestive process. This process accounts for lessening of the possibility of plaque build- up. Thus, HDL’s are labeled as “good” in the body by many researchers. LDL: Low-density lipoproteins – The main function of LDL is to transport cholesterol from the liver to tissues that incorporate it into cell walls. Higher levels of LDL (high risk 240 mg/dL or more) may promote a build up of plaque in the arteries over time. Thus, LDL’s are associated with the potential for “bad” heart health. How serious is high cholesterol? High cholesterol increases the risk of atherosclerosis, also known as hardening of the arteries. Atherosclerosis consists of deposits of cholesterol, fatty matter, cellular waste, calcium and fibrin (clotting substance in the blood) in the inner lining of the artery. This accumulation is called plaque. A common area for blockages in the body is the carotid arteries, located in the neck. 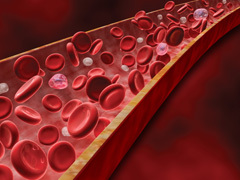 Plaque can also occur in arteries elsewhere in the body. Special arteries, called coronary arteries, bring blood to the heart. Narrowing of your coronary arteries due to plaque can stop or slow down the flow of blood to your heart. When the arteries narrow, the amount of oxygen-rich blood is decreased. This is called coronary heart disease. High blood cholesterol is diagnosed by checking levels of cholesterol in your blood. 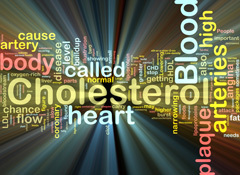 It is best to have a blood test called a lipoprotein profile to measure your cholesterol levels. You will need to not eat or drink anything (fast) for 9 to 12 hours before taking the test. If it is not possible to get a lipoprotein profile done, knowing your total cholesterol and HDL cholesterol can give you a general idea about your cholesterol levels. Testing for total and HDL cholesterol does not require fasting. If your total cholesterol is 200 mg/dL or more, or if your HDL is less than 40 mg/dL, you will need to have a lipoprotein profile done. Cholesterol levels are measured in milligrams (mg) of cholesterol per deciliter (dL) of blood. See how your cholesterol numbers compare to the tables below. Triglycerides can also raise your risk for heart disease. If you have levels that are borderline high (150–199 mg/dL) or high (200 mg/dL or more), you may need treatment. In test results, total cholesterol levels of 240 mg/dL or higher are considered high risk. Levels from 200 to 239 mg/dL are considered borderline-high risk. National Heart Lung and Blood Institute: How is High Blood Cholesterol Diagnosed? What Other Things Can Cause Plaque in Arteries? Physical inactivity – Not exercising can result in weight gain, which leads to increased cholesterol levels. What are some of the Traditional Treatment methods? Statin Drugs – are these right for you? What are some of the alternative treatment options? CoQ10 – Levels of CoQ10 tend to be lower in people with high cholesterol compared to healthy individuals of the same age. Taking CoQ10 supplements can correct the deficiency caused by statin medications without affecting the medication’s positive effects on cholesterol levels. Read more about Coenzyme Q10 at University of Maryland Medical Center.